Imagine that somewhere in India there is a palm leaf with your entire life written on it- past, present and future. When Asha heard Deepak Chopra talk about these Nadi astrology leaves, she was immediately fascinated. She dreamed of going to India to find her own Nadi leaf, and in 2006 her dream came true. She traveled to India to be in the film "Asha goes to India" and went to three separate Nadi astrologers in search of her leaf. So how does Nadi astrology work? First, you need to find a Nadi astrology library where the leaves are collected and organized. The Nadi astrologer takes your thumb print on a piece of paper. Thumb prints are categorized into 108 categories and based on your category, the astrologer will find a corresponding "bundle" of leaves. Then the real work begins. Each leaf contains the details of a single person's life, and it must be a perfect match for the leaf to be yours. These details could include: date of birth, mother's name, father's name, number of siblings, and much more. The astrologer will ask you a series of Yes/No questions until you answer "Yes" for every detail on the leaf. Once your leaf is located, you will receive an astrology reading that can be amazingly accurate and detailed. "Where's My Nadi?" is a 15-minute film about Asha's quest for her Nadi astrology leaf. 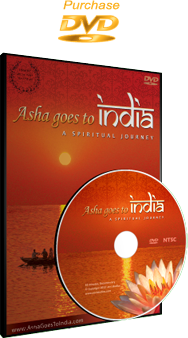 The film is available as a bonus feature on the "Asha goes to India" DVD.